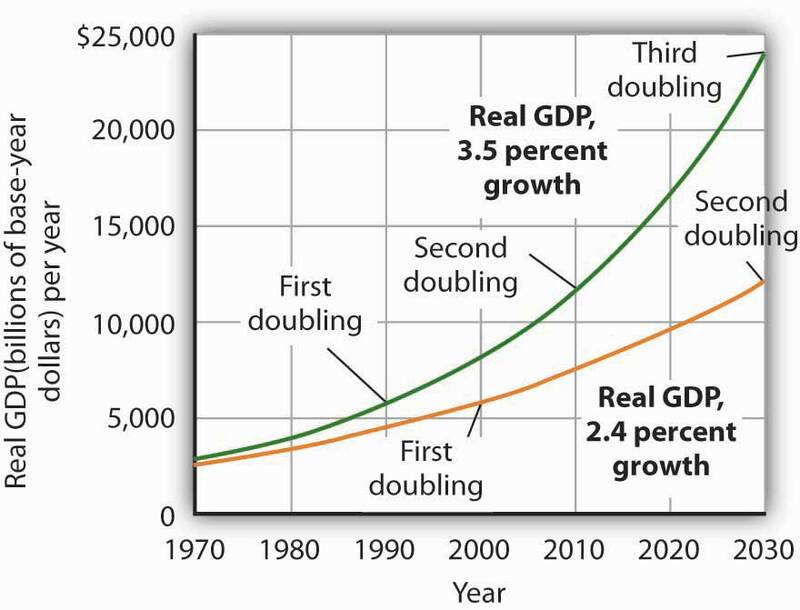 This is “Economic Growth”, chapter 8 from the book Macroeconomics Principles (v. 1.1). For details on it (including licensing), click here. Start Up: How Important Is Economic Growth? How important is economic growth? The best way to answer that question is to imagine life without growth—to imagine that we did not have the gains growth brings. For starters, divide your family’s current income by six and imagine what your life would be like. Think about the kind of housing your family could afford, the size of your entertainment budget, whether you could still attend school. That will give you an idea of life a century ago in the United States, when average household incomes, adjusted for inflation, were about one-sixth what they are today. People had far smaller homes, they rarely had electricity in their homes, and only a tiny percentage of the population could even consider a college education. To get a more recent perspective, consider how growth has changed living standards over the past half-century or so. In 1950, the United States was the world’s richest nation. But if households were rich then, subsequent economic growth has made them far richer. Average per capita real disposable personal income has tripled since then. Indeed, the average household income in 1950, which must have seemed lofty then, was below what we now define as the poverty line for a household of four, even after adjusting for inflation. Economic growth during the last half-century has dramatically boosted our standard of living—and our standard of what it takes to get by. One gauge of rising living standards is housing. A half-century ago, most families did not own homes. Today, about two-thirds do. Those homes have gotten a lot bigger: new homes built today are more than twice the size of new homes built 50 years ago. Some household appliances, such as telephones or washing machines, that we now consider basic, were luxuries a half-century ago. In 1950, less than two-thirds of housing units had complete plumbing facilities. Today, over 99% do. Economic growth has brought gains in other areas as well. For one thing, we are able to afford more schooling. In 1950, the median number of years of school completed by adults age 25 or over was 6.8. Today, about 85% have completed 12 years of schooling and about 28% have completed four years of college. We also live longer. A baby born in 1950 had a life expectancy of 68 years. A baby born in 2004 had an expected life of nearly 10 years longer. Of course, while economic growth can improve our material well-being, it is no panacea for all the ills of society. Americans today worry about the level of violence in society, environmental degradation, and what seems to be a loss of basic values. But while it is easy to be dismayed about many challenges of modern life, we can surely be grateful for our material wealth. Our affluence gives us the opportunity to grapple with some of our most difficult problems and to enjoy a range of choices that people only a few decades ago could not have imagined. 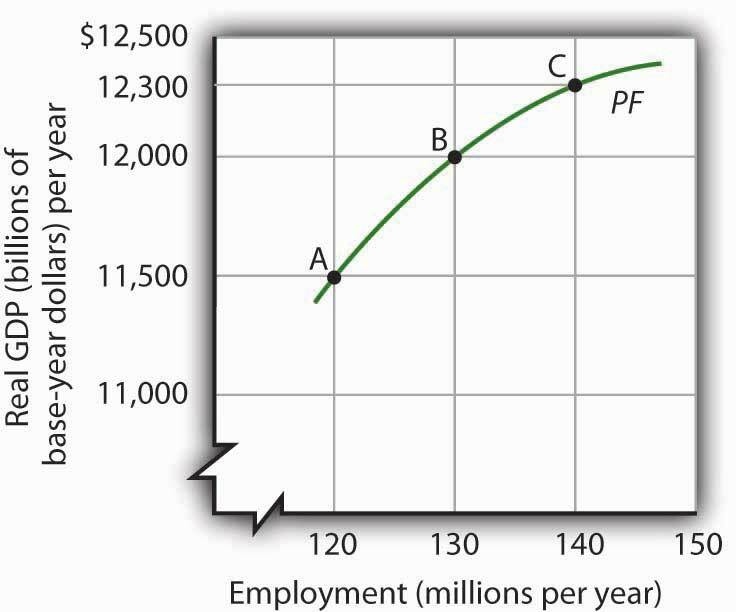 We learned a great deal about economic growth in the context of the production possibilities curve. Our purpose in this chapter is to relate the concept of economic growth to the model of aggregate demand and aggregate supply that we developed in the previous chapter and will use throughout our exploration of macroeconomics. We will review the forces that determine a nation’s economic growth rate and examine the prospects for growth in the future. We begin by looking at the significance of growth to the overall well-being of society. Figure 8.1 "A Century of Economic Growth" shows the record of economic growth for the U.S. economy over the past century. 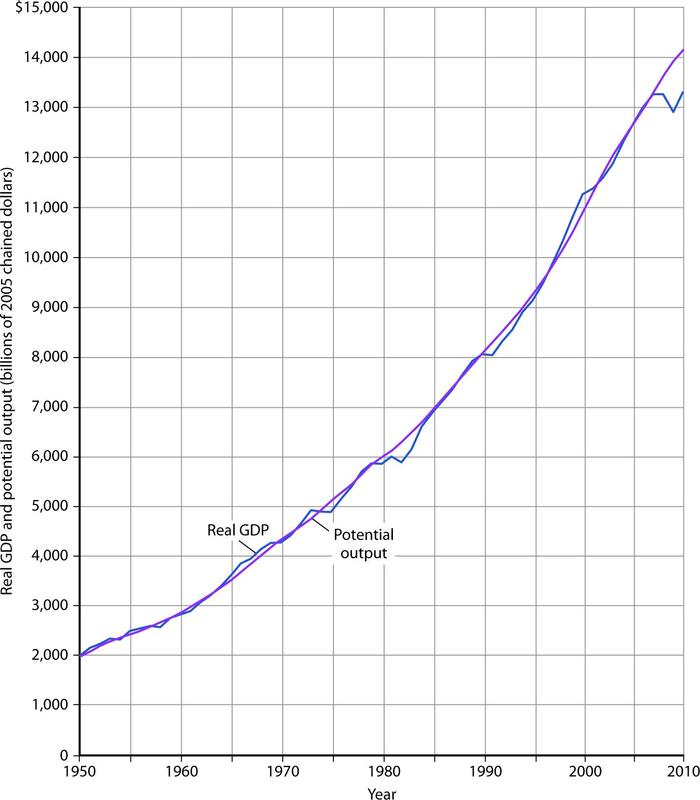 The graph shows annual levels of actual real GDP and of potential output. We see that the economy has experienced dramatic growth over the past century; potential output has soared more than 30-fold. 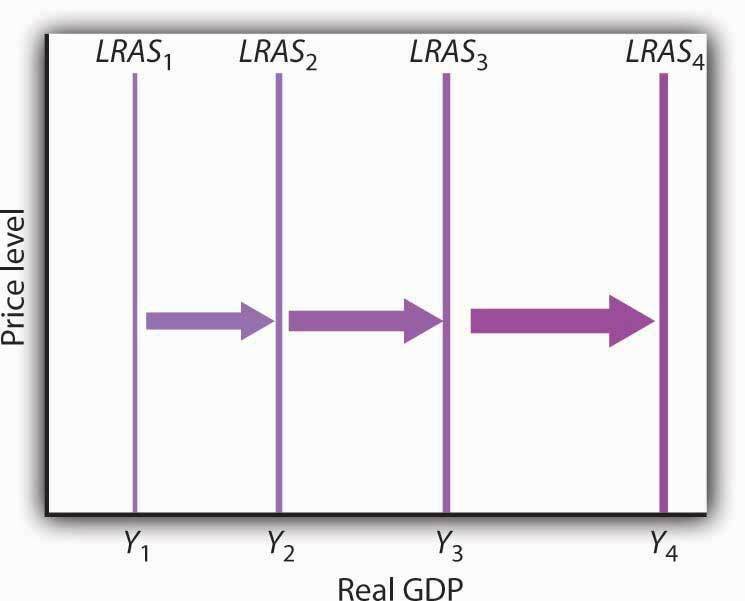 The figure also reminds us of a central theme of our analysis of macroeconomics: real GDP fluctuates about potential output. Real GDP sagged well below its potential during the Great Depression of the 1930s and rose well above its potential as the nation mobilized its resources to fight World War II. With the exception of these two periods, real GDP has remained close to the economy’s potential output. Since 1950, the actual level of real GDP has deviated from potential output by an average of less than 2%. At the start of the 21st century, the level of potential output reached a level nearly 30 times its level a century earlier. 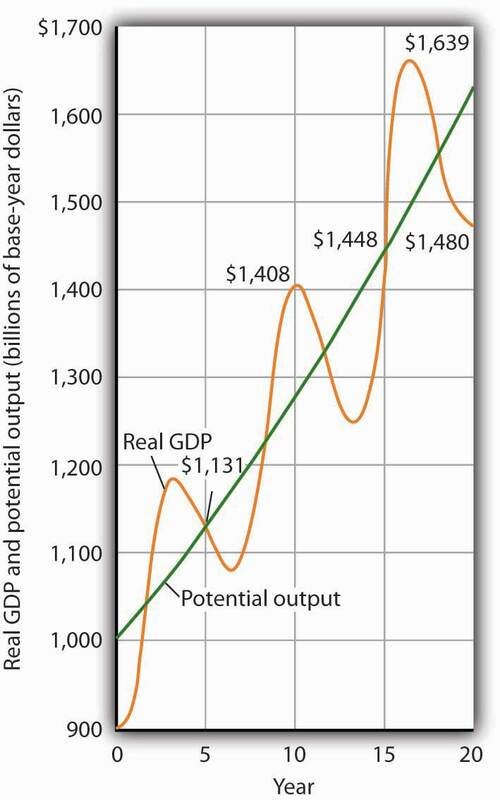 Over the years, actual real GDP fluctuated about a rising level of potential output. Source: 1900–1949 data from Robert Gordon, Macroeconomics, 6th ed. (New York: HarperCollins, 1993), Table A-1, pp. A1–A3; data for 1950–2010 from Congressional Budget Office, The Budget and Economic Outlook, August 2010. The presidents’ economic records are clearly affected by luck. Presidents Truman, Kennedy, Reagan, and Clinton, for example, began their terms when the economy had a recessionary gap and ended them with an inflationary gap or at about potential output. Real GDP thus rose faster than potential output during their presidencies. The Eisenhower, Nixon-Ford, H. W. Bush, and G. W. Bush administrations each started with an inflationary gap or at about potential and ended with a recessionary gap, thus recording rates of real GDP increase below the rate of gain in potential. Only Jimmy Carter, who came to office and left it with recessionary gaps, presided over a relatively equivalent rate of increase in actual GDP versus potential output. The sources of growth for the U.S. economy in the 20th century were presented in the chapter on sources of production. 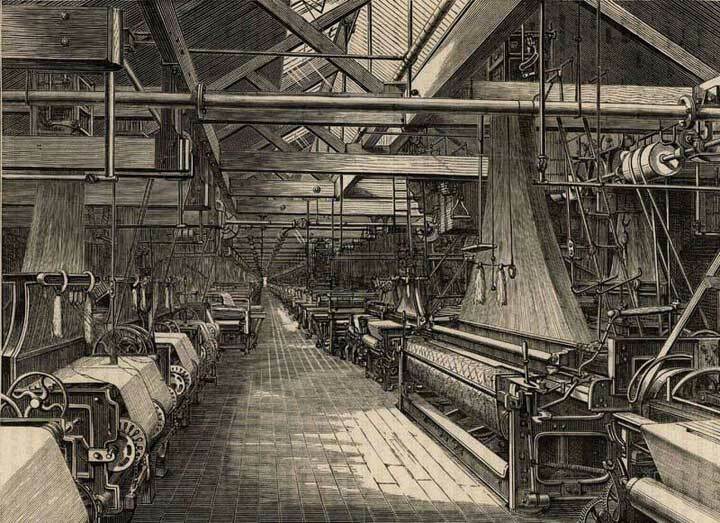 There we learned that the main sources of growth for the United States from 1948 to 2002 were divided between increases in the quantities of labor and of physical capital (about 60%) and in improvements in the qualities of the factors of production and technology (about 40%). Since 1995, however, improvements in factor quality and technology have been the main drivers of economic growth in the United States. Toward the end of the 20th century, it appeared that some of the world’s more affluent countries were growing robustly while others were growing more slowly or even stagnating. This observation was confirmed in a major study by the Organization for Economic Co-operation and Development (OECD),The material in this section is based on Organization for Economic Co-operation and Development, The Sources of Economic Growth in OECD Countries, 2003. whose members are listed in Table 8.1 "Growing Disparities in Rates of Economic Growth". The table shows that for the OECD countries as a whole, economic growth per capita fell from an average of 2.2% per year in the 1980s to an average of 1.9% per year in the 1990s. The higher standard deviation in the latter period confirms an increased disparity of growth rates in the more recent period. Moreover, the data on individual countries show that per capita growth in some countries (specifically, the United States, Canada, Ireland, Netherlands, Norway, and Spain) picked up, especially in the latter half of the 1990s, while it decelerated in most of the countries of continental Europe and Japan. Source: Excerpted from Table 1.1 Organization for Economic Co-operation and Development, Sources of Economic Growth in OECD Countries, 2003: p. 32–33. The main sources of growth for the United States from 1948 to 2002 were divided between increases in the quantities of labor and of physical capital (about 60%) and in improvements in the qualities of the factors of production and technology (about 40%). Since 1995, however, improvements in factor quality and technology have been the main drivers of economic growth in the United States. There has been a growing disparity in the rates of economic growth in industrialized countries in the last decade, which may reflect various differences in economic structures and policies. 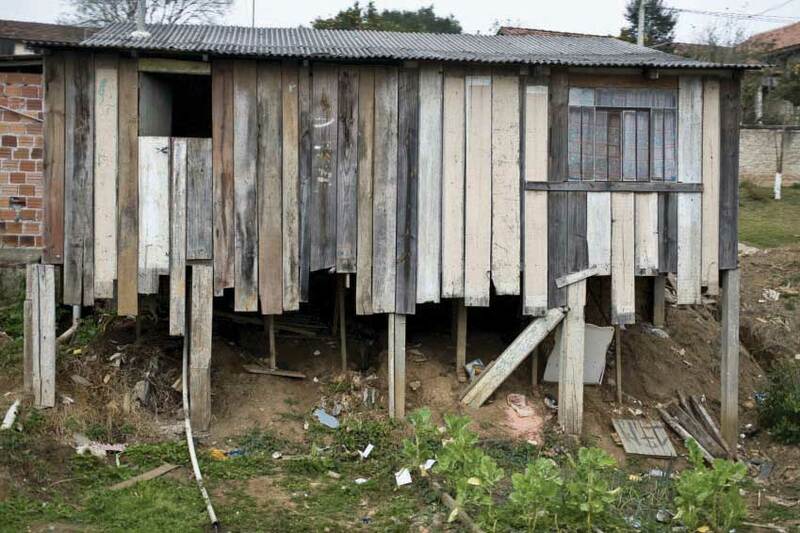 Poor countries just need more physical capital, you say? Easterly points out that between 1960 and 1985, the capital stock per work in both Gambia and Japan rose by over 500%. The result? In Gambia, output per worker over the 25-year period rose 2%; in Japan, output per worker rose 260%.